Until this year, Thanksgiving and Christmas were the only occasions sweet potatoes made it into my life. I would dutifully try the orange dishes year after year, not wanting to seem ungrateful or immature. But if I’m honest, I didn’t particularly enjoy eating them. Somehow the way they straddled that line between sweet and savory made my palate cringe. I couldn’t wrap my head around eating anything covered with marshmallows alongside green beans and meat. It just felt so wrong. It wasn’t until I had the pleasure of trying deliciously crisp, salty sweet potato fries that I realized I might need to reassess this whole aversion thing. At first, I was solely fixated on them in fry form. And why not, they are just sooo freaking amazzing. Sweet potatoes became my saving grace while I did my 40 days of no processed sugar and carbs. But I also couldn’t help thinking… there has got to be more I can do with them. So, slowly but surely they are finding new ways into my diet. This recipe happens to be one of them. I made a vegetarian version, but you can easily throw in some chicken for more protein. I would just bump up the eggs to 4 and add a bit more milk and cheese to coat everything. 1. Preheat oven to 400F (200C). 2. Toss diced sweet potatoes in olive oil and sprinkle with salt and pepper. Place in a large casserole dish and bake until soft for around 15 mins., stirring every 5 minutes. 3. While potatoes are baking cook pasta. In a large nonstick pan on medium heat, cook sausage until begins to brown. Add in diced onion and cook in the fat rendered by the sausage. When the onions become transparent add in either fresh spinach and wilt it OR the frozen, drained spinach. Turn heat off and crumble in the feta. 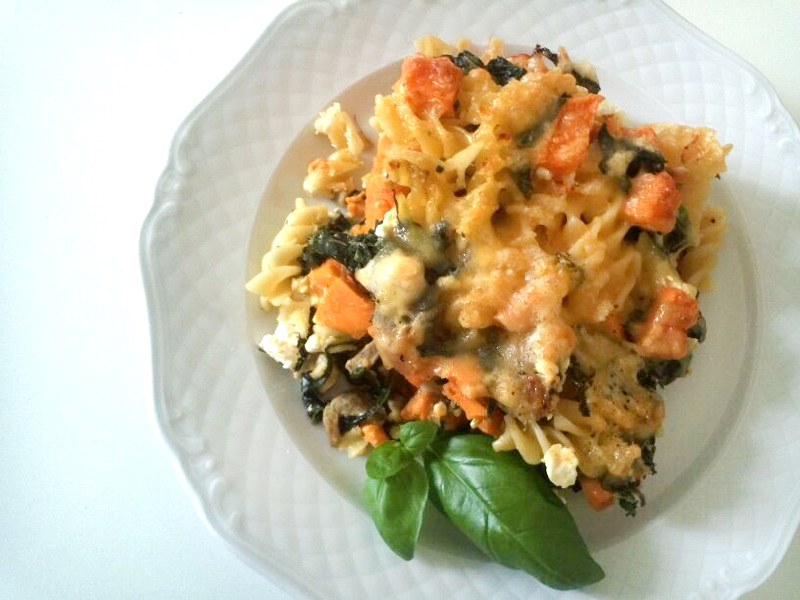 Add the cooked pasta and spinach mixture into the casserole dish and toss ingredients together.